Humans have started hanging out in the back yard of The Pond again. It's a group of about 10, mixed male and female. Yesterday I fed them a bunch. This morning I didn't see any, but I put out soda and pizza anyway. However, it ended up being ant food instead of human food. I'm a little afraid for the field behind The Pond. There are a couple of green tractors trundling back and forth over the whole thing, with the words "John Deere" next to them. Clearly someone is picking corn, and it makes me wonder if the farmers, or someone else, plans on replanting with soybeans. UPDATE: I'm not expecting to see that Spaniard back again, either. It was standing on top of one of the improvements put in by the local human civil engineers, fishing in the drainage stream behind it. Unfortunately, last winter men from the county came through here and pulled out all the stuff the engineers had put in, the spoil sports. I don't really understand why they did it, either. I thought the stream was a lot neater the way the engineers had it set up. Of course, for engineers, flooding is a bug, not a feature. That's probably the reason why. Regardless, our creek is no longer inviting territory for Spaniards, so I doubt it will be back. Our humans aren't redheads. They used to be, though. None of the ones around now have red hair. But some of them have pocket protectors on their shirts; I'm assuming those are geeks. I'm wondering if my memory has gone bad. I could have sworn the humans were nerds. Of course, one possibility is that the nerds are the winter shift, and the whatever-the-heck-is-out-there-now (geeks?) is the summer detail. UPDATE: Actually, they might be nerds. It might just be that there are no calculators around. The pocket protectors apparently are for 'math majors'. As you're aware, I work at the Duck U. Bookstore. Yes, I'm one of those people, squeezing ridiculous amounts of cash out of poor struggling college students, yadda yadda yadda. Whatever. Don't get me started. Anyway, it's that time again. Froshducks move in on Saturday. Classes for everyone begin on Wednesday. From today thru end of the month, the Duck U. Bookstore will do roughly 1/3rd of our yearly sales. Gonna be a little busy... I WILL post coverage of the Turkish GP activites, but I may not get to much else. THIS has to be the all-time greatest bit of unintentional humor. I can see the hundreds of spit-takes from the unsuspecting readers now. Mr Headline Writer, thank you for making us feel all warm and tingly... again. Earlier this week saw the 62nd anniversary of the nuclear bombings of Hiroshima and Nagasaki. As is always the case, there were the usual gatherings of protester groups around Duckford, deploring the use of Fat Man and Little Boy. Usually I ignore these uninformed people, knowing that they are simply kneejerking to the anti-war sentiments of the Cold War era. Unfortunately, I went to a grocery store today, and in the parking lot was a small group of noisy protestors. None of them were over 30, I'd guess, and none of them had any grasp of the history of the Pacific War, other than that the US was bad for using nukes. A moment of insanity later, I found myself in a discussion with them. Unfortunately for them, I could answer any of their claims and provide references, to boot. Why? I wrote a short paper on this topic a few years back, as part of an argument I was having. Of course, they weren't really listening to me, one even going so far as to claim that the Japanese military was 'a band of noble warriors'. When I asked them about Unit 731 and Bataan (the first two things that lept to mind), they all gave me blank looks. In the end, I told them that I agreed with them: nuclear weapons are terrible things, and I hoped they'd never be used again, but I disagreed with them regarding their use in WWII... and that I'd put my paper here on The Pond for them to read. Post contains 1553 words, total size 9 kb. 2 A moment of insanity, indeed. One thing living in SF this long has taught me, is that if anyone feels strongly enough about something to go and protest it, there isn't anything anyone can say that would make them change their mind. Or at least admit to their protesting friends that they've changed it. But your point about the justifications for the use of the bombs is well made. We can deplore their use, as well as deplore the horrible situation that led up to their use. What do these folks protest on Dec 7th? 3 Consider also that the USSR had declared war on Japan just days before the atomic bombs were dropped on Hiroshima and Nagasaki. My histories put the Soviet declaration of war on Japan as August 8th, two days after and likely in response to the bombing of Hiroshima. It's also interesting to note that the US ordered something like 500,000 Purple Hearts in preparation for the invasion of Japan. We're supposedly still issuing them today, and still have around 100,000 left. It's also ironic that other than the nature of the weapon used, there's not much particularly different about Hiroshima and Nagasaki when compared to the rest of the bombing campaign. The results of firebombing a major industrial city aren't particularly nice. 4 Civilis, quite right on the date. The point made is still the same. I hadn't heard that Purple Heart story before... wonder if it's true? I can certainly believe it. And, truth be told, the big firebombing of Tokyo actually killed MORE people and destroyed MORE of that city than either Bomb did. I'm not sure why that doesn't cause more outrage, except for the spectre of nuclear weapons. Well, nobody said the protestors has to be logical. Vauc, they don't protest ANYthing on December 7th. Why should they, when some revisionist historians think Pearl Harbor was OUR fault? No, not just the stupid "Roosevelt knew!" conspiracy theories (hmmm... sounds kinda familiar), but also that since WE cut Japan's access to scrap metal and oil, by refusing to sell it to them, the Pacific War was the noble Japanese Warrior's reaction to being stabbed in the back. China? Never mind all that, it wasn't important. 5 Because I don't remember where I heard it, I searched and found the purple heart story at http://hnn.us/articles/1801.html. 1. The home front and the internment of Japanese Americans. 3. The use of the atomic bomb. It pains me to say this, but these areas might be more important for the average American to remember than details of the military campaigns of the war, and they provide object lessons for us today. But if you're going to debate modern geopolitics, especially using World War 2 as an example, you really need to know your stuff. Regurgitating anti-American propaganda will not cut it against anyone who knows their history, as the post demonstrates. You were able to demolish the protesters through knowledge of the facts. Thanks to the good offices of Vaucaunson's Duck, I've recently been exposed to the glories and wonders of "A Bit of Fry and Laurie." May I now present... The Barman Sketch. 1 Oh man I love Fry and Laurie. Fry owns a sort of bookshop/social club called the QI club here in Oxford as well. In fact, you should ask your friend if they've got any episodes of QI, Stephen Fry's quiz show, it's very good. In some ways they're the natural successors to Peter Cook and Dudley Moore, Laurie and Moore going off to America to have further success, Fry and Cook, often seen as the funnier and more talented, staying in Britain doing their own little projects. Fry was also the second person in Britain to own an Apple Mac, with Douglas Adams being the person ahead of him in the queue. 2 That was... Pythonesque. And I mean that in a good way. The rain that was supposed to occur last night actually happened around 1pm today, and it just bucketed. Animals were walking by the Duck U. Bookstore in pairs, though I didn't see an annoyed, long-bearded man in robes anywhere nearby. Unfortunately, you may have seen something about Duckford on TV yesterday, as we DID get flooding... just not anywhere near the Duck U. campus. It was an area of town that was flooded during last year's Labor Day storm ... That particular day was termed a "100 years' storm"... which puts the past few days in perspective, I suppose. That area of town hadn't yet recovered from the flooding of last year, now they got it again. Is the Gorebot nearby or something? It must be global warmening! Or coldening. Or, more likely, raininging. My phoneline is down at The Pond, so I may not be around much for a couple of days... we had something like a half-foot of rain last night, and all of Duckford is suffering. UPDATE, 1030pm: Honey, I'm home! The phone came back about 20 minutes ago, about 24 hours sooner than was predicted... they must've found the break/water-damage/whatever. Quite the interesting day, all told. As I mentioned, Duckford got a half-foot of rain overnight. When I went to bed, it was raining, but nothing out of the ordinary. From people I spoke to, around 4am all hell broke loose, and there were sightings of pairs of animals heading north. By the time I woke up (around 720am), the rain had stopped, and around The Pond there was no obvious sign that there had been anything untoward about the storm. It was on the drive in to Duck U. that I started to notice little things... like entire yards covered with water, or big honkin' trees down, or live power lines sparking and zatzing in the road... that seemed to indicate that something large had happened. Then the city evacuated the land to the west of Duck U. The U. is positioned on top of a hill, y'see... along with a 'water retention structure' located in a park. Said structure (aka 'dam') was about, oh, a foot or so from being overfull (additional rumors were that the dam was leaking and about to let go), and was beautifully positioned to swamp a chunk of the business district to the west. As you can guess, we weren't all that busy at the Duck U. Bookstore today. When I did leave, I went to pay a visit to Momzerduck and Ph.Duck, and drove by the park in question... which was completely submerged. I noticed one of the baseball diamond backstops, just the top of which was visible... eep. However, all is right now... except it's damn hot, and really damn humid. 1 Good luck, hope you don't have any problems with flooding, we've had a bout of it over here recently (luckily not us, but our town had a lot of hassles). See you when you're back up and ready to shout about Alonso/Hamilton. 2 It's weird that it's hot and humid. A storm like that is almost always caused by a cold front, and all the rain is water coming out of the air. 3 Would it help if I said that we're expecting more rain (dear god) later tonight? The big puddles (read: small lakes) dotting every field, yard, garden, piece of astroturf, or anything colored green might have something to do with it, too. Just as the air around an ocean is somewhat humid, so to is the air around Duckford. Actually, NOAA suggests that we'll be getting rain every night for the next few nights. Great. Swell. The ground went from "pretty darn dry" to "incredibly saturated" overnight, and now we'll be going to "waterskiing down 2nd Street" by tomorrow. 4 This summer has been strange here, too. For the local kids it's been a real bust; it's been overcast and cool for the last three weeks, and we've gotten a couple of rain storms, too. The Willamette valley is known for rain; it's nothing unusual for us here. But it doesn't usually happen in July and August, which are usually sunny and warm-to-hot. Earth to go splat on the Sun like bugs on windshield. 1 No doubt it's happened elsewhere, but the idea of it happening to Earth specifically, as claimed in the headline, is ludicrous absent some sort of really dramatic perturbation of the system. It would take a close pass by another star. If another star approached to being about as close to the Sun as Neptune, all bets are off. But without that kind of event, not gonna happen. Everything I've read is that the Earth will be destroyed when the Sun goes nova and becomes a red giant, about five billion years from now. I'm not too worried. 2 Nor am I, but now we know why the Weekly World News has gone out of business. They can't compete with a state-subsidised newspaper like Pravda. 3 Anyway, we know it can't happen because it would be solar-caused global warming, and there is no such thing. 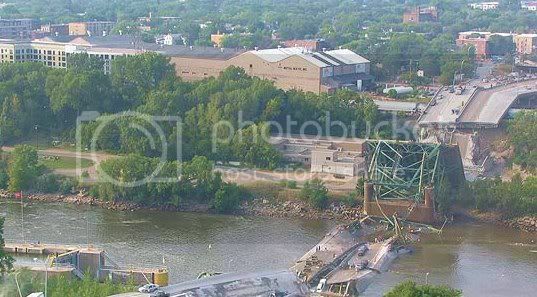 About 3 hours ago, a major bridge across the Mississippi river collapsed during rush hour in Minneapolis. I-35W is a large traffic artery in the Twin Cities, and this bridge carries an average of 100K-200K cars every day. It's very close to the U of Minnesota (MSP Campus), and near Dinkytown. Breaking news shows six dead, six in life-threatening condition, and dozens (possibly hundreds) with 'minor' injuries. The whole bridge just fell down with no apparant warning. We're not just talking about some of the bridge, but the entire thing. The section over the river, the sections that run to the land, everything. The bridge was an "over-under" span, with a road bridge over a rail bridge. 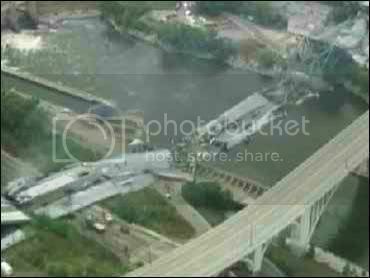 There was a train loaded with tanker cars on the bridge when the road span collapsed on top of it. 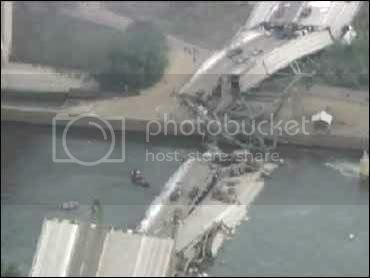 Eyewitness reports say that there "had to have been" hundreds of cars bumper-to-bumper on the bridge at the time of the collapse. There was construction ongoing on the bridge, but not structural: pothole fixes and that sort of thing. Fortunately, Ph.Duck's family, many of whom drive this bridge every day, have all checked in: everybody's okay. I lived in Minnesota for two years, and have driven across this bridge dozens of times. I'm just... stunned. 1 Judging by news pics, the bridge that went down is not the one with the railway--that was the concrete bridge next door. Could be wrong--I seem to be the only person on the web who has never driven on the bridge, nor knows anybody personally who has. 47kb generated in CPU 0.08, elapsed 0.275 seconds. 49 queries taking 0.221 seconds, 273 records returned.